Basically you’re creating 3 ponytails in succession; highest pony is the main pony and the only one that should be seen, the lowest pony will give you the extra length, and the middle pony joins both of them together, which gives the impression that there’s only 1 really long ponytail there. Section all the hair from your temples upwards and tie it in a high ponytail; that will be your first and highest pony (Step 1). Then move that pony out of the way (Step 2) and separate a small chunk of hair in front of your ears on each side (Step 3). 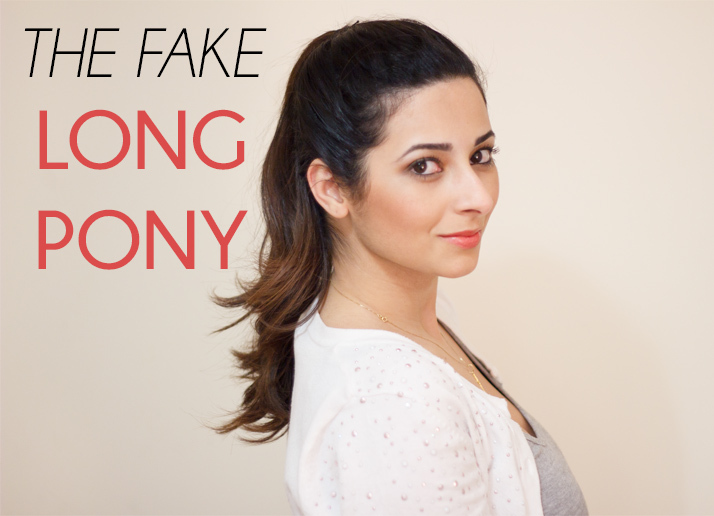 Gather whatever is left in a really low ponytail (Step 4); the lower this pony, the longer your fake ponytail will be. Separate a small section of hair from the bottom of the top ponytail and from the top of the bottom ponytail (Step 5), and join them together in the middle, creating the third pony (Step 6); tighten the middle pony a little by pulling the sections of hair apart for a more streamlined overall look. Bring the top ponytail down and use the two chunks of hair in front of your ears (Step 7) to hide the evidence of a middle ponytail by pinning them to the sides (Steps 8, 9 & 10). And you’re done! How simple was that? I absolutely love this little trick and it definitely helps with the long hair nostalgia! 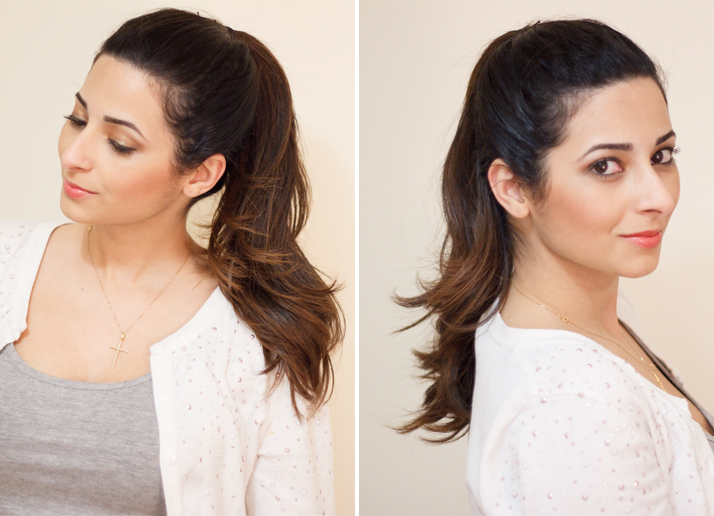 If you curl the ends of you hair, it will help all the ponytails blend in better and it will give you a bit more volume! My hair is so thick that these seems like a great way to do a high ponytail! wow! Great trick! I have seen it before but you have explained it so effectively! Thanks so much. I will try it for sure.